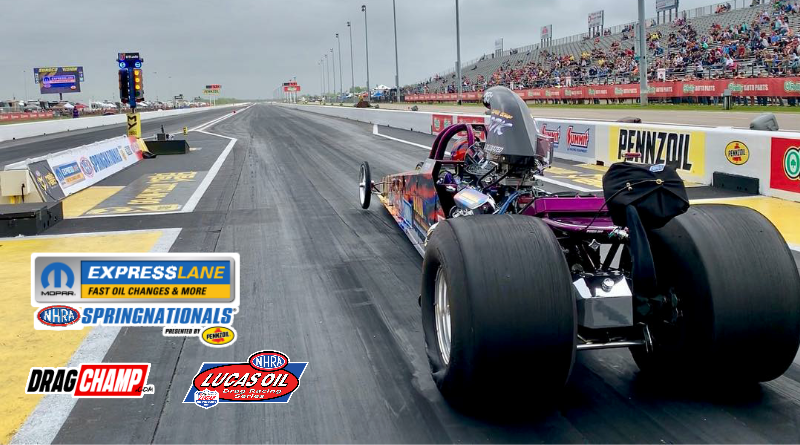 Baytown, Texas – Sportsman competitors dodged the rain on Saturday morning while working in several rounds of eliminations at the NHRA Spring Nationals. Each of the sportsman classes at Houston Raceway Park have been narrowed down to the final three or four competitors. Every racer left in competition has to believe they can win the event. Now the waiting game starts as their next round of competition is over 24 hours away. Racers will need to manage their emotions and nerves until it’s go time tomorrow afternoon. A full recap of Saturday’s action is listed below including updates on our pre-race picks for each class. It took just three rounds of eliminations to reduce the field to the final four. Phillip Giles, David Latino, Pete Peery, and Darrin Christen are all that remain after two days of competition. Giles reached the semifinals after an interesting quarterfinal match with Craig Gualtiere. While they left together, both drivers missed the tree by a mile, Giles (.153) and Gualtiere (.143). At the strip Gualtiere would go -.001 under his 9.55 dial to hand the win to Giles who posted a dead-on 9.298 ET for the win. Latino won a double redlight race against Aaron Stanfield. Stanfield was -.007 while Latino followed a tenth behind with a -.002 reaction to move on. DragChamp pre-race pick Pete Peery continued his march to the final after Dale Hulquist broke-out in the quarterfinals. In previous rounds, Peery took out hitters Terry Emmons and Slate Cummings. Christen made his way to the Big Show on Sunday after taking down last week’s Stock winner Jacob Pitt in a double breakout encounter. Division 4 Lucas Oil Double Header Race Results from the Texas Motorplex. Tomorrow it will be Latino versus Christen and Peery versus Giles. With four rounds in the books, only three Stockers remain. Brett Candies, our pick to win in Super Stock, has a bye to the final round. Jacob Pitt will race Woody Gary in the semifinals for a shot at the final round. Candies has been solid at the tree but his car has been deadly. He has ran dead on his dial-in in three out of four rounds. Brett defeated 2018 Super Stock winner Brenda Grubbs in the quarters. He used a dead-on 9.452 ET to force Grubbs into a -.007 breakout. The win earned Candies a bye run to the final round. Pitt, a winner at the Division 4 Lucas Oil double header last week at Dallas, continued his recent hot-streak with great driving at Houston Raceway. Pitt has driven the finish line like a champ to earn a spot in the Sunday show. Waiting for Pitt is Woody Gary. Gary used a great .012 light to force Sam Lusco into a -.007 breakout in his quarterfinal win. Gary took out last year’s event winner Tim Snively in round one and Greg Stanfield in the second round. Our impressive DragChamp picks all fell in the early rounds on Saturday. Our team this week included Jeff Lopez, Austin Williams, and Slate Cummings. The Super Comp field has been whittled down to just three cars. Keisha Moline, Chris Vang, and Vernon Rowland are all that remain after four rounds of competition. Moline has been impressive throughout eliminations. She used a 8.906 to take out red-hot Cole Cummings in round one. She followed that will a close win over two-time world champ Austin Williams. After defeating Lupe Tortilla racer Chase Murray in round three, Moline used a 9-pack to defeat Shannon Brinkley. Rowland has been spectacular at the tree, his worst light is a .013. This propelled him to wins over Rick Huffman and Jay Bunce in the first two rounds. In rounds three and four Rowland took out both entries from Team Elrod. After defeating Tony Elrod, Rowland won a close double breakout contest with Jacob Elrod. Division 5 racer Vang made the long trip from Colorado payout after earning a bye to the final earlier today. While his lights have not been spectacular, Vang has kept his car above the index in every round. He’ll get a free time trial tomorrow prior to the final round. The DragChamp pre-race picks did not fare well at Houston. Keisha Moline took down Austin Williams and Chase Murray in consecutive rounds. Koy Collier, who’s still alive in Super Gas, fell to Justin Frost in round two. The highly competitive Super Gas field is down to three after four rounds on Saturday. Robert Rowan, Koy Collier, and Chris Best will compete for the Wally on Sunday. Rowan used a .013-package in round one to secure the number one spot on the ladder. He continued his run to Sunday by cutting killer reactions and running close to the index. His worst light was a .017 in his round three victory over John Salter. Collier, the defending Super Gas event winner, has put together a nice win streak at Houston Raceway Park. Koy ran dead on the dial in rounds three and four to post packages of .024 and .017 respectively. He’s also taking out a talented list of racers including Joe Harper, Shannon Brinkley, Alan Savage, and Jeff Lopez. Former Fall Nationals winner Chris Best is looking for another final round appearance this week. Best has been quick at the tree and managed the finish line perfectly to position himself for another winners circle. Rowan gets the bye on Sunday while Collier and Best will battle for a spot in the final round. Of note, the worst light any of these three guys have posted in eliminations is a .019. The last two rounds should be entertaining to watch. Top Dragster racing at the NHRA Spring Nationals has been impressive to say the least. Running in the 6.20’s at over 220 MPH is tough but the packages these guys have been posting is ridiculous. In round three, Rusty Baxter squared off with teammate (and DragChamp pick) JR Baxter. Rusty was .012 total for the win! He combined a .012 reaction with a 6.190 to leave JR mathematically ineligible. JR was .014 take .004 and was in the way. Incredible! Ross Laris kept his team’s hopes alive for yet another final round appearance. The Laris Motorsports Insurance team has found the final round at every event they’ve attended this season. Ross picked up the T/D win at the Baby Gators and is looking for more this week. Laris, the number one qualifier, took a close .002 win over Bill Swan in round three. Ross will meet Rusty Baxter in the semifinals on Sunday. William Kruse earned his way to a final round appearance on Saturday. He will have a bye in the semifinal round tomorrow. Kruse has been spectacular posting killer lights and running near his dial. His worst light was a .012 in round two which he combined with a dead-on 6.239 to defeat Jim Thorp. Kruse defeated Holden Laris in round three to prevent any hopes of an all Laris final round. DragChamp is your source for NHRA sportsman drag race results. We cover national events like no one else. Check back daily for detailed coverage of each sportsman class.